JEGS GS-1 High Back Sport Seat fits universally into any car on both driver and passenger sides and weighs only 36.5 pounds. Adjustment features include: left and right rear tilt forward levers, left and right rotary recline knobs, and front side-mounted slide lever. Ideal for Almost Any Application! These simulated leather seats look and feel like the real thing but without the price tag. 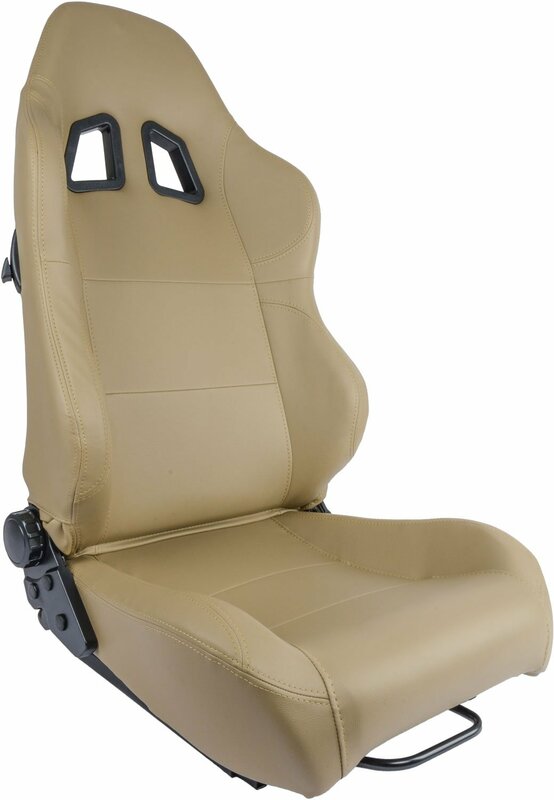 JEGS High Back Sport Seats are designed to accommodate factory belts or aftermarket harnesses, seats fit both driver & passenger sides (seat mount sold separately). Side contours provide leg, lumbar, and shoulder support to hold you firmly yet comfortably. Adjustment features include: left and right rear tilt forward levers, left and right rotary recline knobs, and front side-mounted slide lever. Seats are available in black, beige, or light gray. 70245 is rated 3.3 out of 5 by 6. Rated 4 out of 5 by Marc1953 from Great seat but there are down sides to seat. I must say that when I received the seats they were everything that I had wanted. Color was consistent, construction was solid, materials appeared to be of a nice quality and lastly they looked exceptional. Now the down side. Measure the seat area in which you wish to install the seats. If trying to install in a c4 (1996) corvette check you measurements twice. If using original powered seat bracket the seat is to large. Seat will also not bolt to the original bracket. Seat will be blocked by you seat belt and cover. If you are going to get new brackets so you may lower seat and will mount to seat you have very few options. It would be nice if JEG also sold the brackets that could be used with the seat. If you contact Wedge who will make the brackets for the seat first thing that they want to know is the dimensions for bolt pattern for the seat. Information isn't available and you can only get that after you have measured the seat which has arrived. On a personal note I was installing the seats to lower my seat in the car. Manual brackets with sliders will accomplish this if this what you are after. By a narrower seat though. Rated 4 out of 5 by Pops59 from Great seat for the price I opted for these sport buckets rather than reupholster the factory bench seat in my 78 GMC truck. You get what you pay for, but at this price point it is a great seat. The seat backs are straight rather than curved forward, so you need room behind them if you want to recline. Rated 1 out of 5 by kbarrett302 from DO NOT BUY THESE SEATS I have about 5,000 miles on these seats and they are without a doubt the worst car seat i have ever sat in. The seating position is terrible, there is absolutely no way to comfortably lean your head back, which is also extremely dangerous in the event of an accident. I have never felt so fatigued after driving as i have after a Colorado to Georgia trip in these seats, it took a few days after the trip for us to normal again. The stitching on the seat bottom ripped after only 1000 miles, exposing the overly dense foam. The foam in the sides of the seat bottom pops off of the metal frame, making it VERY uncomfortable. The seat back bobs back and forth with the slightest of pot holes. I would not put another pair of these seats in my car if someone paid me to do it. Does it come in Gray/Grey? will they fit in a 76 stingray? You will need to modify your brackets to make this fit. Will these seats work with power seats? No, these are manual seats and will not work. Does the seat come in different colors? This seat is offered in this beige and black also. How big is the seat at the shoulders and at the seat?